February 22nd was “Nikkori Fufu-no-hi (Smiley couple’s day) and one couple exactly matched this expression(=smiley) visited our office yesterday. 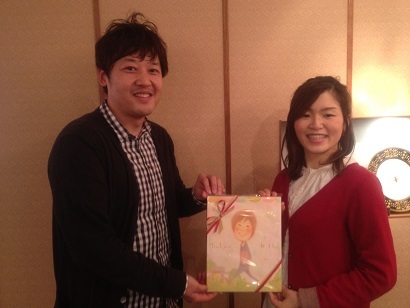 Mr. and Mrs. S got married last November. It has been three and a half years since I had met them for the first time. As we had known for a long time, I was so moved when I saw their proud moment on the day of wedding. I still remember that as if it were yesterday. 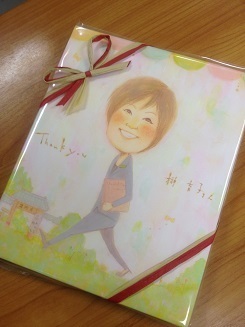 Then I got my portrait as a present from them. I couldn’t hold back my tears, as it really conveyed me their heartfelt message. If you look the picture carefully, you can find their names and on the file I’m holding were the letters “planning”. These nice arranges were made by the illustrator who draw this portrait from just one photo. I found the fact that you can inspire others by transforming your feeling into other expression instead of words. Each time I see this portrait, it should make me feel “OK, I’ll try my best again”. S-san, M-san, thank you so much. I’m looking forward to seeing two of you; a “smiley couple” again.